Beat and I went out for a mountain bike ride on Friday evening. I have a favorite mountain bike loop from home, over Black Mountain and down Stevens Creek Canyon, that's 26 miles with 3,400 feet of climbing. I recently introduced Beat to this loop and he was excited to go back on Friday, but I just wasn't feeling it. I was weak, sluggish and struggling with the climb a lot more than normal. I self-prescribed "slight overtraining" and admitted I was glad I had a mellow weekend planned. My baby sister, Sara, was visiting from Huntington Beach, Calif., for Memorial Day. She's not what you'd call an outdoor type, so I figured our weekend activities wouldn't be all too active. But that didn't make the ten-mile climb any easier. Finally at the top, Beat and I bundled up in several layers of warmers, hats and jackets as a cold wind blew along the ridge. 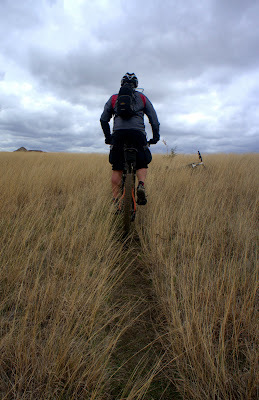 We launched into the singletrack, and the rush of gravity and wind pumped new life into my tired legs. The feeling of well-being was extremely short-lived, however. I rounded the first curve at high speed and washed out both tires on the gravelly trail. I've rounded this same corner in this same way more than a dozen times, and it caught me so off guard that I didn't even put my arm out to catch myself. I just full-body slammed into a garden of small but pointy rocks and skidded several inches, slightly ripping my shorts as well as a decent amount of skin across my right leg. If I hadn't been wearing so many layers, I would have surely sustained more trail rash, but as it was, I was dust-covered and bleeding. Beat stopped just before the curve to find me staggering around in an effort to walk it off. When he asked what happened, all I could say was, "Crash ... hurts ... not hurt ... just impact ... hurts." With an elbow, leg and confidence all badly bruised, I rode the brakes the rest of the way home. My little sister is what you might call Bizarro Jill — on the outside, we share several common traits, but as far as personalities go we're the opposite in nearly every way. Sara is fashionable and outgoing, picky and a little high-strung. She dislikes seafood and actually most foods that I consider amazing. She also doesn't really like doing stuff outside, unless that stuff is shopping, going to the beach, or watching a concert. I am on a constant if low-key crusade to get Sara hooked on cycling. Last spring I helped coerce her into buying a beach cruiser, which she sadly stopped riding after it got a flat tire. For her first visit to the South Bay area, I convinced her and her boyfriend to join me on a "mellow" bike path ride to Google headquarters and back, about 16 miles round trip. I set up Sara and Spencer on my and Beat's mountain bikes, and joined them on my fixie commuter. I adjusted the mountain bike's seat post for Sara but failed to shift the bike out of the gear it was in, which just happened to be the highest gear. See, when you ride a bike as much as I do, it stops occurring to you that functions like shifting and braking a bicycle aren't simply second nature to everyone. Sara's entire bike experiences basically amount to short rides on single-speed cruisers with coaster brakes. 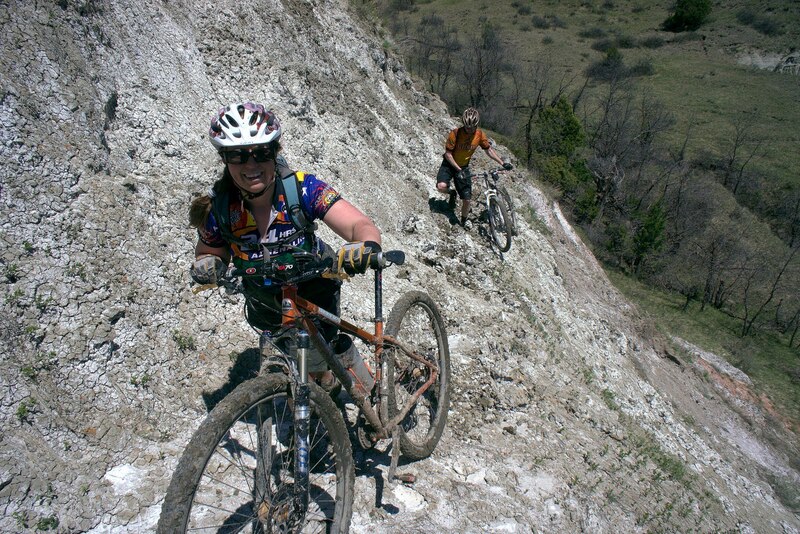 She mastered the mountain bike's brakes just fine, but she never shifted out of high gear. Leading from the front, I didn't notice Sara mashing the pedals to get up the steeply inclined pedestrian bridges along Highway 85. About two miles from Google, she tweaked a muscle in her back, in a way that stopped her in her tracks. But Sara, being a Homer, only mentioned in passing that her back hurt and insisted she wanted to keep pedaling to Google. It wasn't until we were halfway up the viewpoint hill that I noticed Sara walking her bike, with a distinctly pain-stricken, arched-back chicken stride. I discovered the high-gear faux pas too late. She was in considerable pain. We called Beat for a rescue ride and Spencer and I raced the rain home — a hard effort that put him on the floor, too. Bad older sister, bad. Luckily Sara's back injury didn't turn out to be too debilitating. Despite the stiff chicken walk, Sara still rallied for their planned trip to the city. Beat and I had a friend's wedding reception to attend in San Francisco. In my effort to purge belongings before I moved away from Alaska, I managed to unload nearly all of my formal clothing, and I don't own a single pair of stockings. (Somewhere in Utah, my mother is cringing right now.) I ended up wearing a business suit with a knee-length skirt, and below that was my lower-leg mountain bike trail rash in all of its scabbed glory. Beat said the wedding would be full of ultrarunners, so most of the guests would laugh it off, but I had to explain myself to more than a few commenters. The wedding reception was held on a small "floating island" in San Francisco Bay called Forbes Island. It was a fun place and a beautiful reception, but I have a penchant for sea-sickness and Sunday was a particularly windy day in the harbor. I had a few moments early on where I was truly worried I might have to "feed the fishes" at my friends' wedding reception, but luckily a couple of glasses of ginger ale from the bar and a retreat to the lower deck set me straight. On Monday, Sara and Spencer headed home. Beat and I joined Steve for a "short, mellow" run in the East Bay area that turned into 12 miles up to Mission Peak, along the ridge to Monument Peak, and back. I felt much better after a relatively restful weekend, but once we started downhill my leg bruises started to bother me with increasing sensitivity, and I mostly limped down. It was still a great weekend if slightly off camber. I'm hoping I can right myself this coming week. Also, in anticipation of the new book release in a couple weeks, I'm still offering copies of my first book, "Ghost Trails" at a discounted price. I have a few signed paperback copies available for $12.95. The digital eBook for your Kindle, Nook, Sony Reader, smart phone or computer is available for the discounted price of $2.99 at this link. Purchase the eBook direct from Amazon at this link. Signed paperback copies of "Ghost Trails" are currently available for $12.95 plus shipping. Click the gold button for checkout. Signed copy of "Ghost Trails"
I posted an excerpt from "Ghost Trails" below. This is all of Chapter 9, "Rainy Pass"
The Puntilla Lake Lodge was little more than a roof and a stove pipe sticking out of a small mountain of drifted snow. Its elevation was about 2,000 feet, an unlikely altitude for human inhabitants in that part of the world. Weather that would be considered extreme anywhere else — 20 below temperatures, 40 mph wind gusts, white-out blizzards — was normal weather outside the Puntilla Lake Lodge. Around its wind-scoured walls, the last strands of spruce before alpine tree line, with scraggly branches all blown to one side, provided little protection. The wood stove blasted out dry heat as the lodge’s manager — a teenage boy — handed me a can of clam chowder that had been boiling on a camp stove, and a thin paper napkin to hold it with. I took a plastic spoon and stirred the off-white glop around the blackened can. The soup burned my fingers and charred my throat, but I finally had some of my appetite back and did not want to waste it. I began to nibble on discs of pilot bread, a quintessential Alaska Bush emergency food that supposedly never goes soggy or stale. It tasted exactly like a soggy, stale saltine cracker. Beds had been stacked together side by side in the tiny, single-room building. They were mostly empty now with the exception of Brij, who was sleeping soundly on a bottom bunk, and the teenager, who seemed grumpy about the necessity of staying awake past 4 a.m. He did not seem to want to chat with me. I tried to ply information about the trail ahead and he told me simply that two guys had been up to the pass on their snowmobiles the day before, but he had no idea if the trail was broken beyond there. I asked him if any of the other cyclists had opted to go over Hell’s Gate, a long-way around that veers around Rainy Pass but tacks on 33 extra miles. He just shrugged. “I think they all went over the pass,” he said. For someone who lived so close to the edge of civilization, he didn’t seem to have much interest in what existed beyond. I asked him if he stayed at the lodge year round. He said he only spent the winters there, helping out his family, who operated the lodge for hunters, snowmobilers and sled dog mushers. I smiled at the thought of a winter destination resort in Alaska. The wind outside rattled the cabin’s log walls, and frost was forming near the inside corners despite the wood stove. Puntilla was a strange place to spend a winter when most Alaskans were retreating to California and Hawaii, but such is the nature of the Iditarod Trail. I sat down on one of the beds and began to strip off my soggy clothing. I examined my problem areas and became alarmed when I saw my right knee was extremely swollen, but then again, my entire leg was swollen. I was probably just retaining water. My right big toe was surrounded in an enormous blister, which I decided I would believe was simply a blister, and not frostbite. I took three aspirin, two Tums and two glucosamine pills, covered my knees in menthol patches, popped a cough drop in my mouth and laid down on the hard mattress. I never expected the accommodations in this race to be luxurious, but I was a bit surprised just how Spartan they actually were. People actually lived like this for entire winters. There were probably others who lived like this their entire lives, in tiny cabins set against the continent’s largest mountains, with only mortared logs and wood stoves to hold back the constant needling of the fingers of death. The unwelcome light of dawn hit my face at about 8:30 a.m. Brij was shuffling around the cabin, packing up his gear. The teenage lodge manager was still awake, and still staring blankly out the window. No one had come in behind us yet. Not Ted, and not the last straggling Euro cyclists. I half expected to see Geoff catch up to me by now, as slow as I had been moving. I looked around the room, but all the other beds were empty. I asked Brij if I could head out with him. He nodded, but we both knew I would only be able to hold his wheel for a few miles. I opted instead to take off early, let him catch me, and that way keep at least one racer in my time zone for as long as I could. My gut was still empty when I walked into the glare of the heatless sun. I could not stomach the thought of more pilot bread and can-flavored soup. I still had a frame bag full of nuts and Clif Bars, so I certainly wasn’t going to starve. The cold air wrapped around me, but its grip had been softened since the morning before. I tried to tally how many hours of sleep I had logged overnight and couldn’t decide if it was three or 27. It was Tuesday now, 9 a.m., and I was already losing track of time to the relentless pull of the trail. The morning was clear and cold and bathed in a kind of intense beauty that was nearly incapacitating, as delirious and exhausted as I was. All I could do was keep my feet on the pedals as my eyes darted around in awe. In the blindness of the night before, I had climbed all the way into the sister peaks of Denali. After 165 miles of watching them from a distance, I was finally carving my way into their direct shadows. The trail, only shallowly tracked by the two snowmobiles the lodge manager had mentioned, softened quickly in the sun. After three miles, I gave up the hard pedaling and resumed walking with my bike. A red fox darted down the trail beside me, stopping briefly to look back before it raced ahead, much faster than I could ever hope to move. Brij soon followed, wishing me good morning as he swerved through the soft snow in his strongman effort to ride as much of the trail as possible. Sunrise climbed over the barren peaks, and the last strands of spruce gave way to thin alder branches and huge, open meadows that in the summer would be covered in tundra. In February, they were simply expanses of snow, blank sheets of paper scribbled with bare branches and the deep tracks of a dozen riders who walked through here before me. Footprints were always a discouraging sign. Having watched them appear occasionally on the trail since the second day of the race, I had ascertained that I was one of the least skilled snow bikers out there. Most of the cyclists proved able to ride in places where I could not, and their footprints were a mark of the trail’s deterioration. When there were a single set of footprints, I could often ride, but not always. When there were three or four, mine were nearly always behind them, walking. When there were eight or more, I didn’t stand a chance of mounting my bike and coaxing the wheels to turn. The snow was just too soft, the incline too steep, the effort too difficult. Still, the long bike push up into the Alaska Range was something I had expected, and nothing could sour my mood in the midst of such sweeping beauty. I pulled out my camera and shot a self-portrait against the chiseled white peaks. I looked at the digital display, an image of my black hat coated in frost, a swirl of frozen hair, a bright red face and a huge smile. I looked so happy. It made me smile again. I pulled out a celebratory peanut butter cup and stuck it in my mouth. I was becoming more used to the culinary experience of frozen food — tasteless, dry and repulsive at first bite, it would slowly dissolve into warm and creamy sustenance. It was still hard to coax much of it down. If I had a hundred peanut butter cups, I probably would have eaten them all, but I didn’t, so I forced down two crunchy granola bars and called my 400-calorie breakfast good. The wind picked up more force as the afternoon approached. I crossed the last long, open meadow and turned right into a narrow canyon, the final ascent to Rainy Pass — at 3,300 feet, the highest point on the Iditarod Trail. The trail took a turn for the very steep; the pushing became backbreaking work. I dug my boots into the snow, and with my hands clenched around the brakes, pushed the bike forward with all of my strength just so I could take another step. My shoulders ached and my biceps burned. I cursed the fact I had not spent at least some of my training time in the gym lifting big weights, but in the heatless sun of that third day, all of my physical training seemed to hardly matter anyway. Sure, I was fit, but I had probably been nearly as fit for such an effort six months before. I really should have spent more time researching light gear, learning to ride a bike on top of soft snow, and buying peanut butter cups. It didn’t even seem odd to me that, in the midst of a terribly difficult bike race, my physical fitness suddenly seemed meaningless. Not all humans are equipped to win races, but everyone comes preprogrammed with the will to survive. My mood swung wildly all day long. In the morning, I had experienced peaks of elation so extreme I could hardly breathe. But as I clawed my way up Rainy Pass, I found myself dipping into new depths of despair. A few times, I stopped walking because I could not visualize another step up the mountain. And then, just as it had so faithfully on Dismal Swamp in 2006, my will to survive pushed the autopilot button, and the mundane miles kept coming. After a few of those deep lows, it was hard to even pull my emotions back to normal levels. The beauty of Rainy Pass, which surrounded me like a fortress, was already slipping behind a curtain of indifference. I did not even mind the impending darkness as I crested the pass at sunset. If anything, no longer being able to see all the miles in front of me might do my emotional health some good, I thought. I dropped down the pass several hundred yards to get out of the wind. I ducked into a rocky outcropping that was just unusual enough to have possibly been built by hands. Sure enough, I found a sign, weather faded and coated in ice, with simple black letters spelling out “Rainy Pass.” I took a lot of comfort in that simple marker of civilization — proof that humans had come through there before me, and proof that I was still on the right track. I thought wistfully of hiking with my dad as a teenager. At all of our destinations, a scenic overlook or a peak, there always seemed to be a sign or a register. We would mark our accomplishment with a phone call home and a big lunch. But there, on the wind-swept ice of Rainy Pass, there was no cell phone reception for miles. I rifled through my frame bag to look for something to eat for lunch and realized that the setting sun meant it was nearly 6 p.m. I had eaten nearly nothing since my granola bar and peanut butter cup breakfast— a few nuts here and there, a few dried cranberries and fruit leathers. I was probably lucky if I had a thousand calories in me for the entire day, and still I did not feel hungry. I settled on two more peanut butter cups — even though I already had eaten my daily allotment — half of a five-ounce chocolate bar, and a Clif Bar that I had been thawing in my coat pocket. It was a meager dinner and it tasted like frozen mud, but it was my duty as a survivor to put it down. As I started down the pass, the footprints grew more deep and even more numerous. In fact, all I could see were footprints. There were no longer any snowmobile tracks, no evidence of any trail at all. There were simply the racers who came before me, stomping through knee-deep snow down the steep slope, laying the only path I had to follow as night descended. After three more miles of slow downhill walking and no evidence of any trail at all, it became apparent that not only did I have to walk up Rainy Pass, I was going to have to walk down it as well. Downhill pushing was an effort I never anticipated. With big tires, bicycle riding in the snow is nearly always possible downhill, even when the trail is soft. But without a tracked trail, weight just sinks into the powder and wheels become useless. A set of skis or snowshoes could have at least offered my body some float, but I had none. I waded through the knee-deep snow and wondered aloud, to the peaks disappearing into the night above me, how much farther it was to the next checkpoint, Rohn. I guessed it was at least 20 miles. At my most hopeful walking speed, 2 mph, I still had 10 more hours to push. In the midst of a powder slog, my pace was probably closer to 1 mph. The need for sleep was surrounding me like a smothering cocoon. I did not know if I could handle another all-nighter, but did not believe I could survive a night out. So I walked, because walking meant life, and stopping meant death, and in that state of extremes, there is actually little to fear. I knew I had to keep moving, so I did. All of the surrounding threats — the cold, the moose and wolves, the open streams, the looming darkness, the remote location — faded behind a primal drive to stay in motion. Although I was quickly succumbing to exhaustion and becoming more aware of just how far I had still to go, I did not despair. I did not even hit the same level of lows that I had experienced mere hours earlier, when my toughest challenge was pushing my bike up a steep hill. I felt good, actually, because I was still moving. And as long as I was moving, I was alive. Several hours passed into oblivion, not quite awake but not yet asleep, as my bobbing light cast a sickly yellow glow on the endless march of footprints. I followed them, down steep hills, beside the twisting branches of spruce trees, across thin ice over a rushing stream and into the heart of the night’s darkness. I was lucky to have those footprints. If it had been up to me to navigate myself in that state of mind, I might have walked right off a cliff or into open water. But it’s hard to say how inept I would have been if I had been completely on my own. The will to survive is strong, and it drives as effectively as it can, but only as much as it has to. In countless hours of post-race reflection, I have tried to piece together the sequence of “what went wrong” in those final hours awake on the backside of Rainy Pass. My memories are dim at best, obscured by physical overload and mounting indifference. But I remember stopping, the way I had dozens of times that day, turning off my headlamp and looking up at the sky. A dim ribbon of green light wavered in the narrow strip of sky above the mountains, peaks so white they glowed against the moonless night. Stars glistened behind the northern lights, and I groped for the elation I deserved, the appropriate response to unspeakable beauty. I felt nothing. I turned on my light and moved to take a step, but my legs wouldn’t move. They simply refused to move. I knelt into the snow and let out a long, almost relieved sigh. My will to survive was firing just enough to alert my retreated intelligence that I was in the midst of a serious bonk. I had run out of fuel, finally and completely. The will to survive would have let me continue if I had no other choice, but what little intelligence I had left reminded me that I did have other choices. I had pushed my body to a state of inescapable exhaustion, but I had come prepared for the possibility of motionlessness. My bike still held survival sleeping gear — stuff I had only used and tested a handful of times. So it was strange that like clockwork, like a routine I had practiced a hundred times, I unhooked my bivy bundle, dug a deep trench in the snow, threw a few spruce branches in the hole, unrolled my bivy and crawled inside. 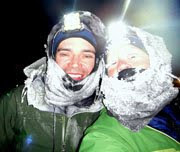 My body warmth filled the sack and I took several deep breaths while comforting myself with out-loud exclamations that “this isn’t that bad.” I reached out to pull my CamelBak, my only source of water, inside with me, and cuddled with the frigid bladder of half-frozen water. Knowing I was in the midst of a bonk mandated as much food as I could stomach, but I was only able to put down the other half of my chocolate bar from dinner. At least I was warm, warm enough to let the fear encompass me again, and the quick glance at my thermometer, still bottomed out at 20 below after two minutes inside my bag, was enough to reignite my smoldering fear. What if the warm cocoon surrounding me failed? How would I possibly crawl 10 or more miles into Rohn? I heard a low, dull howl in the distance that was either a wolf or the wind. I could not remember the last time I felt so alone. In the midst of a lot of nervous energy about finishing up my book, and the tedious promotional work that's gone along with it, I've been grateful for my opportunities to get outside this week. Unfortunately, after the Banff/North Dakota/Ohlone 50K whirlwind of travel and activity, my body hasn't quite been able to keep up. I've been more sluggish than usual, and these days I actually have a GPS/heart rate monitor to show me the ways in which I haven't quite snapped back from recovery yet. 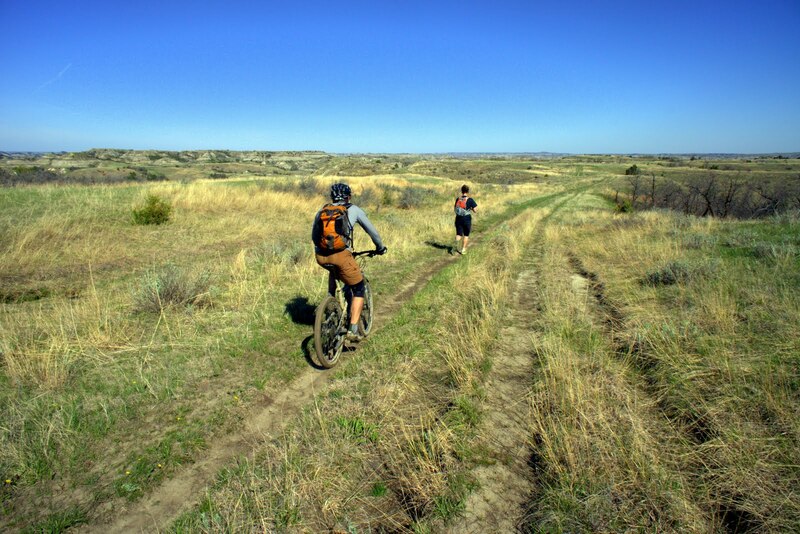 Of course there was the 25-mile mountain bike ride with Beat, the seven-mile run along Skyline, and the Mission Peak hill mountain repeats (Beat's idea ... steep terrain practice) that together amounted to about 8,500 feet of climbing since the race. It's all just a continuation of the last two weeks and potentially the next two weeks. Barring injury or burnout, I actually think it's a good idea for me to "train tired" from time to time so I become will accustomed to carrying on when my body feels less than awesome. Then of course rest to fully recover before the big event. I'm not claiming this is a sound training strategy. Mostly, I'm just shoring up mental stamina to carry me through my next fun slog. Plus, I needed excuses to play outside despite admittedly sore quads and weaker heart rate. That's all training really is to me anyway ... an excuse to play outside. 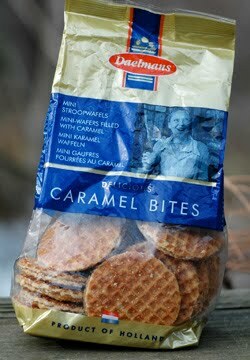 Caramel Bites or "Stroopwafels" from Trader Joe's. Yes, these are the exact same thing. Ok, maybe Honey Stinger uses organic ingredients and packages them in neat individual wrappers. But nutritionally and taste-wise, they're identical. The nutritional indistinguishability is the part that gets to me. 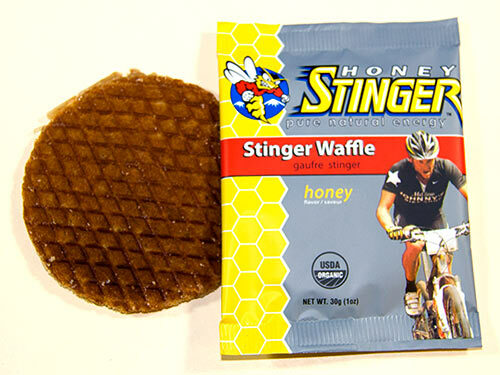 I can't tell you how many aquaintances have praised Honey Stinger Waffles only to balk when I reply, "I know. They're awesome. They're cookies." Not only are they just cookies, but they're unapologetically overpriced cookies. I saw Honey Stinger Waffles at a store in Canada for $3 each. Given the current exchange rate, that's like $147 in U.S. dollars. For a small cookie. Yes, a delicious cookie. Still just a cookie. But because Honey Stinger markets them, they've developed a reputation as a nutritious energy food. Nope. Cookies. Not that I'm against using cookies as energy food. In fact, I'm a big advocate of the taste, convenience and calorie-loading benefits of subsisting on candy and cookies. Which brings me to the next segment of my blog post. Occasionally during the next few weeks, until my book release next month, I'm going to post short excerpts from "Be Brave, Be Strong: A Journey Across the Great Divide" so readers can get a feel for the content. I will offer book pre-ordering soon. This is an excerpt from Chapter 18: "Untouchable"
I had become an expert on small-town convenience stores. Even independently owned service stations, buried in the most remote regions of the west, all had a near-identical selection of products laid out in a nearly identical way. Their organization was both simple and highly effective, designed for the maximum obtainment of junk food. 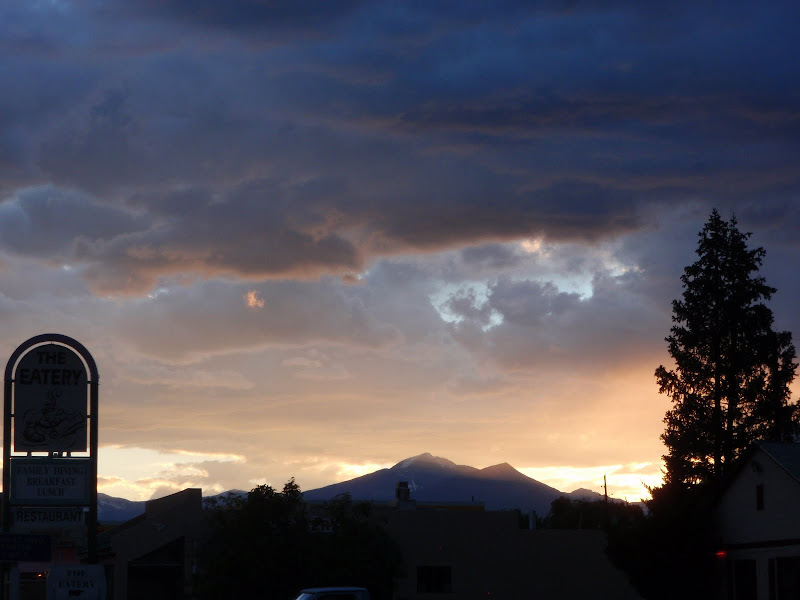 I walked into the Salida 7-Eleven with single-minded purpose, knowing I would not pass another significantly populated town on the route for more than 150 miles. I strolled down the first aisle, also known as the candy bar aisle, and selected four king-sized Snickers bars — which not only boasted 500 calories each, but were also usually the most popular and therefore freshest items on the shelf. I then grabbed four pairs of Reese’s Peanut Butter Cups, prone to melting but probably okay in the high mountain air. The next aisle, the salty snack aisle, held my Corn Nuts, regular nuts, and packages of crackers. The next aisle, the specialty candy aisle, was my favorite. It was here that I was treated to the widest and most thrilling range of selection that can only be found in gummy snacks. I was partial to Sour Patch Kids, but I liked to mix it up with gummy bears and sour worms and sometimes something florescent and obnoxious and full of artificially flavored and chemically colored high-fructose corn syrup. 7-Eleven also carried chocolate-covered espresso beans, a special treat for the mornings I anticipated waking up in a sleeping bag. In the “regular food” aisle, I usually picked up tuna packets and the occasional energy bar. The refrigerated shelves along the outer edge of the store held my orange juice, liters of Pepsi, yogurt, and the hopeful rewards in my never-ending search for wax-coated balls of cheese. I finished with an extra-large cup of coffee and a quick browse of the gourmet cases in front of the store, where I could obtain 600-calorie “homemade” brownies and the cinnamon roll I planned to eat for breakfast before heading out the following morning. After less than five minutes of "shopping," I’d walk to the counter and dump 10,000 calories — about two days’ worth of food — in front of the startled clerk. “Um, did you find everything you needed?” she asked. The clerk in Salida was more bold than most, and she smiled wryly. “Having a little celebration are we?” she asked. Finally, in anticipation of the book launch, I am offering digital files of "Ghost Trails" for the low, low price of $2.99. You can upload an eBook for your Kindle, Nook, Sony Reader, or laptop at http://www.smashwords.com/books/view/62341. "Ghost Trails," my first memoir that I released in November 2008, details the pivotal life experiences that led to my participation in the 2008 Iditarod Trail Invitational — which remains perhaps the most intense and perspective-altering experience of my life. It also provides an entertaining backstory to "Be Brave, Be Strong." While I was living in Anchorage, I dedicated a fair amount of time to shopping my Tour Divide book around in the traditional publishing industry. During my conversations with agents and queries to publishers, I learned a bit about the book industry — namely, that it was not only more difficult and more unstable, but also less profitable than the newspaper industry. An agent who tended to take on "niche" projects such as mine told me her clients were lucky to see advances of $5,000. Plus, royalties and press runs were small enough that few authors even earned out their advances — meaning that $5,000 was all they were ever going to see. And this all came after months if not years of securing a publisher, revisions, marketing, etc. This agent was just trying to be realistic, but it was discouraging. I had worked hard just to capture her attention, only to reach a point where I learned even success in the book business wasn't really that successful. Just before I moved to Montana to return to the publishing business at Adventure Cyclist magazine, I had dinner with a friend where I lamented the bleak prospects for my current book and unwritten future books. I related the hours I had spent working on the project, and how my time spent riding my bicycle around central Alaska and hiking the Chugach Mountains was ultimately more fulfilling and productive. I told him about the school paper I penned when I was 6 years old about "Where I'll Be in the Year 2000" and how I was one of those unfortunate children whose ambition was "to be a writer and write books." "But, geez, I made more than $5,000 in the first year of Ghost Trails," I sighed. He just looked at me quizzically. "Then why don't you do that again?" Independent and digital publishing. Many industry insiders say that's the future. Similar to the sputtering newspaper business, they don't like that it's the future, but they acknowledge it's the direction the industry is headed. As more bookstores shutter their doors and more publishers shed mid-list and niche authors to focus on only those with enough popularity to sell millions, independent publishing will be there to fill in the gaps. I've long believed that outdoor literature has a potential that hasn't yet been fully realized. For the handful of bestsellers like Jon Krakauer who are currently capitalizing on literary nonfiction about outdoor endeavors, there are probably hundreds of talented athletes and explorers embarking on quiet adventures. If even just a fraction of these took the time to sit down and write a book, the world would have some pretty great books. But would these books ever find a home? In this regard, I don't feel as optimistic. It's no longer enough for a book to be well-written and contain an intriguing story. These days, publishers want books that will stand on their own in the mass market, which is dominated by people who would rather read a tell-all by Levi Johnston than Hemingway. Good outdoor literary nonfiction will always find readers, but possibly not enough to survive in this industry. Enter this idea I had, about an independent publishing group. A place where outdoor, nature and adventure authors can reach out to a like-minded audience. Perhaps it won't be millions, but it will be comprised of dedicated readers who truly appreciate this kind of work. And the best part is, in this brave new world of indie books, there's a strong potential for writers to actually be financially rewarded for their time — unlike legacy publishing, which is a game of craps at best. I'm calling the project Arctic Glass Press. I'm only starting to get it off the ground, but I already have interest from a couple of authors — Adam Lisonbee, who recently wrote a series of essays about outdoor stoke and the four seasons, and Eric Bruntjen, who compiled two volumes of art and essays by people who have raced the Great Divide. I appreciate these guys getting on board, and hope that in the near future, Arctic Glass Press will become a great source for off-the-beaten-path armchair adventures. I've also decided to finally release my second book so I can get on with writing my third and fourth book, and so on. The possibilities really are endless. I'm excited. My latest book, about my adventure leading up to and during the 2009 Tour Divide, is called "Be Brave, Be Strong: A Journey Across the Great Divide." I'm hoping to have paperback copies ready to distribute by the second week of June (yes, in time for the start of this year's Tour Divide.) I'll write more about this in an upcoming post, but I've already received good feedback about the few copies I've distributed so far, including an insightful review from my friend, Dave. This blog post is also a call to other outdoor-adventure-writer types. Anyone who has a book sitting on their hard drive or swirling around in their head. As an independent but full-service publisher, Arctic Glass Press can help you finish and polish your project, and release it to the world. Contact me at jillhomer@arcticglasspress.com and I'll send you more information about getting involved with the project. The Ohlone Wilderness 50K was my sixth ultramarathon — since Dec. 18, 2010 I've run five 50Ks and one nicely eviscerating 100-mile snow slog. Beat uses 50Ks as long training runs and I've developed the same habit. I'm really a "relentless forward motion" kind of a person more than I'll ever be a focused runner, so aiming to run a fast 50K doesn't really appeal to me. Being able to run three 50Ks plus another seven or so miles, however, does. So when I set out for a 50K trail race, I'm purposefully aiming to hold a pace that I could conceivably (optimistically) sustain for quite a bit farther than 50K. This of course is only a theory because I won't engage in any longer runs before the Tahoe Rim Trail 100 (although I may have an opportunity to pace as many as 50 miles in the San Diego 100.) But that was my hope for the Ohlone 50K — a sustainable ultra pace. My sustainable ultra pace. As such, Beat and I agreed that we'd run the Ohlone separately, each at our own pace. Beat on his own is quite a bit faster than me, but I had yet to run an ultramarathon without him. During all four 50Ks and the entire 41 hours of the Susitna 100, for better or worse, we were only a few stride lengths apart. It was a fantastic learning technique for me and a decent relationship builder as well, but at some point here I need to learn to slog on my own. Since every single one of my bike races, from 24 hours to 24 days, have been overwhelmingly solo, I wasn't all that worried about a 50K alone. But I admit it's nice to have someone there to remind me to take my Vitamin I at an appropriate interval several miles before the big steep downhills, hand me salt tablets and help me lighten up when I'm being grumpypants. But even with Beat out ahead, it was hard to feel alone at Ohlone. The East Bay classic is one of the more popular trail races in the Bay area, and attracted a sold-out crowd of 200 runners. It's also one of the more difficult 50Ks in the region, a one-way race across a relatively remote section of the Diablo Mountains with about 8,000 feet of climbing (and descent.) I couldn't be less concerned about 8,000 feet of climbing. That much ascent isn't going to break my legs, and it's not going to make or break a race. Really, at the grades we were climbing, a large percentage of the field walks. Some walk at 4 mph and others walk at 3. Not a lot of distance is being gained on the uphill stretches. Downhills, however, open the margin wide. Some fly down the mountains at 10 mph, others shuffle nicely at 6 mph. I prefer to tiptoe down at 2 or 3. Obviously, I was going to have to improve on this. My main issue with downhill running is confidence. I kick rocks. I stumble. I wrench my knee or turn my ankle. Sometimes I fall. The probability of a mishap makes me extremely, irrationally anxious. My steps become more rigid, my breathing becomes shallow and I develop side stitches that range from uncomfortable to debilitating, so constrictive that I have to clutch my abdomen and take big gulps of air just to get oxygen into my system. Short of developing more confidence, which I've accepted will only come with time and experience, the only solution I've found is ibuprofen. If I take two brown pills about 20 minutes before a big downhill, I seem to be able to stave off the side stitches. Obviously, this isn't a long-term solution, but this was my plan for today. This isn't to say the climbs aren't difficult. They are. But I was feeling extremely good today. Honestly, I felt fantastic. This was strange as well because I purposely loaded my training days just before this race. 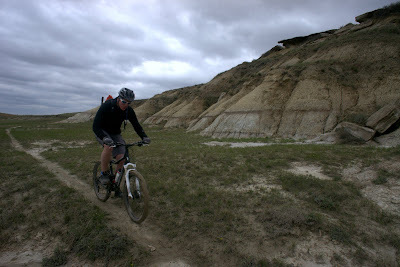 We rode 40 miles on Saturday, ran nine relatively fast miles on Friday, and time-trialed a 2,600-foot climb on Wednesday, to say nothing of my Banff/North Dakota week, which, on top of the 105 road miles and 15 hours of mountain biking, included 46 miles of trail running. The reason was to start the Ohlone on slightly tired legs. That's how you learn how to run 100 miles. It helped that it was not hot today. This race is known for scorching temperatures and I don't think they rose above 70 today; plus, there was a nice breeze. The core group of Californians that I ended up spending much of the race with (we mostly hopscotched, with them flying past me on the descents and me catching back up on the climbs) largely complained about the "cold." I felt like I had dodged a bullet. Although I need to learn to run in heat as much as anything, that doesn't mean I want to. 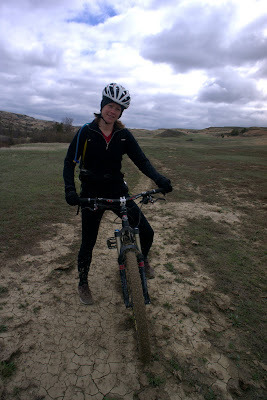 The Ohlone trails were beautiful, and I was stoked about the one-way race course. It was more like going out for a long, scenic (fast) hike than running a race. The scenery was ever-changing and dynamic. The valleys were green and the hillsides carpeted with golden grass that rippled in the wind. We summitted two peaks (Mission and Rose) and two more minor ridges, effectively crossing a nice chunk of the rippling Diablo Range. A race volunteer took a picture of me on top of Rose Peak, elevation 3,817. She said, "It's mostly downhill from here," and I said, "Oh, great, the hard part." But I popped for vitamin I and started down at my conservative pace, which wasn't as bad as gingerly tiptoeing but probably averaged 4-6 mph. Other that taking it purposefully slow to avoid eating gravel or contracting the horrible sidestich, I felt really strong. 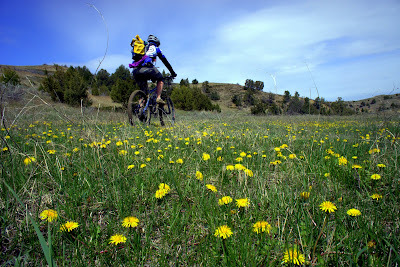 I got to listen to my iPod, drop in the grass to shoot photos of flowers and slum at aid stations to my heart's content. I usually don't believe people when they say this to me, but the truth is there was never a moment when I wasn't having fun. Could I have pushed myself more? Yes, undoubtedly. But could I have possibly had a better-feeling, stronger-finishing and more confidence-building race? Not likely. I ran my fastest pace in the final quarter mile and finished with a big smile on my face in 7:27, which is my second slowest 50K but given the elevation change and difficulty of the course, was really above my typical pay grade. (Garmin data here.) I found out that if I was younger than 30, I actually would have won my age group. The volunteer at the finish kept asking if I was "under 30" and in my post-race haze, I could not figure out what he meant. Under 30 miles? Under a 7:30 finish? Finally Beat told him I was "31." Oh, that 30. For his part, Beat set his own Ohlone PR with a 6:37 finish. Our friends Steve and Harry also put in fast times, and Martina rallied to the finish so hopefully she'll rock San Diego (she's the person I'm supposed to pace.) A great day was had by all. I love living outside. It's an interesting kind of love, because I don't really go camping all that often any more. Truth be told, I can be downright lazy about the prospect of shoring up the gear, food, water and logistics necessary to live on the trail. I can be intimidated by long days under the hot sun, possible hours in the rain and nights curled up in a damp sleeping bag with a chilled wind whipping through my tiny backpacker tent. I'm discouraged by the fact that, no matter how diligent I am about sunscreen, I will return home with lips so chapped they're bleeding, wind-dried eyes and pink patches of sunburned skin; that no matter how much clothing I carry, I will at times be deeply chilled or uncomfortably wet; that no matter how much DEET I bathe in, the bugs will find me. But sometimes, through serendipity or necessity, I forget all that, and I get out there anyway. Every time, without fail, I find myself rolling out my damp sleeping bag beneath a star-soaked sky and smiling at the beautiful simplicity of it all. In the midst of our relaxed evenings in camp, my friends and I once found ourselves discussing "dream vehicles." For many in the group, it was some kind of RV, big truck or van — something you could use to travel around and serve as living quarters away from home. When pressed, I insisted that I have no interest in big flashy vehicles. In fact, I want the smallest, most insignificant vehicle possible — my 1996 Geo Prism came to mind — that I can just leave without concern at random roadsides and set out for weeks on foot to actually travel, to actually live outside. When pressed further I finally just decided that, actually, bicycles are my ideal vehicle. You can pack everything you need to live on a bicycle and travel to far-away destinations, experiencing everything the world has to offer in between. But it's true that lately, I've deviated from pure bicycle explorations and become more interested in what the world looks like on foot. 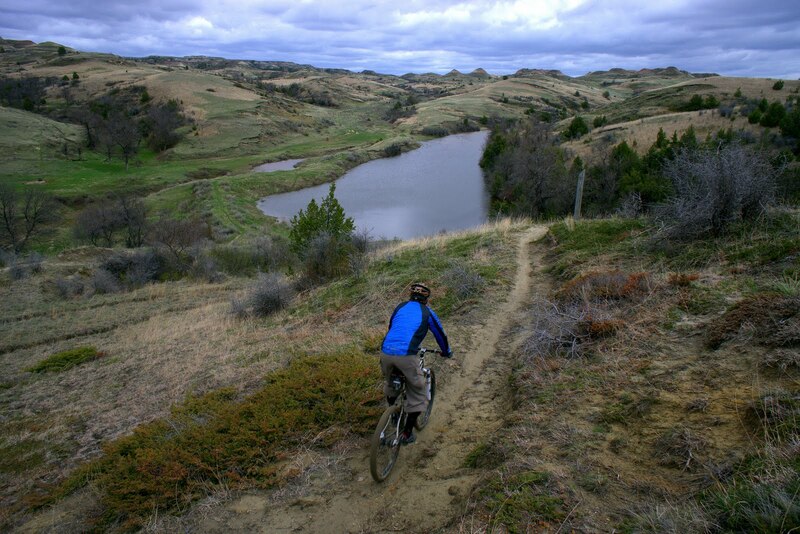 The requisite shuttle around the Little Missouri River (flowing at flood stage) turned out to be a 96-mile van ride all the way back into Medora, across the Interstate bridge and back to other side of the river a mere 10 trail miles from where we took out. The logistics of gravel roads and trail intersections led to us being dropped off eight miles from where we planned to camp that night. Everyone else in the group decided to indulge in the relief of a relative rest day. 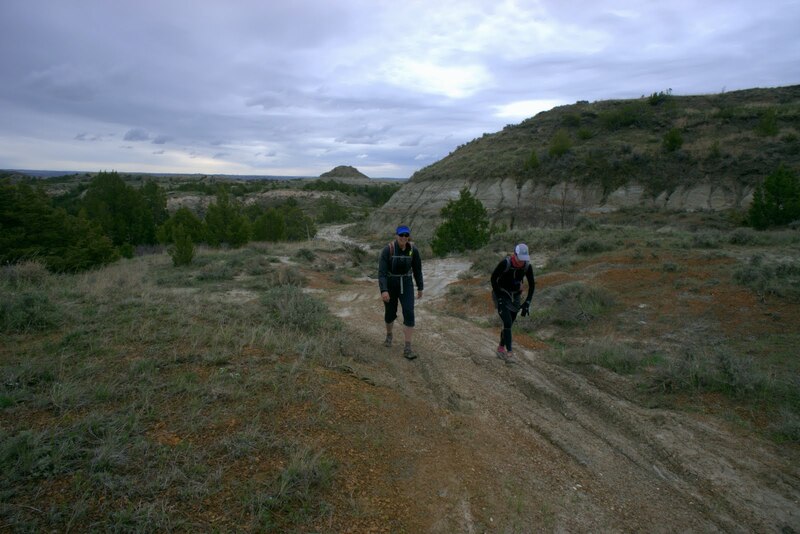 (Even though we were only traveling about 20-25 miles each day, the trail conditions usually resulted in five to six hours of solid effort, more than most of us had bargained for.) I decided to take advantage of the short day to pack my bike back in the van and set out for a long run. When everyone headed north toward camp, I turned south toward the river. The sky was clear and the direct sunlight on white-baked clay made the 75-degree afternoon feel quite a bit hotter. My legs felt strong despite two long days in a row (five hours of biking plus two hours of running.) 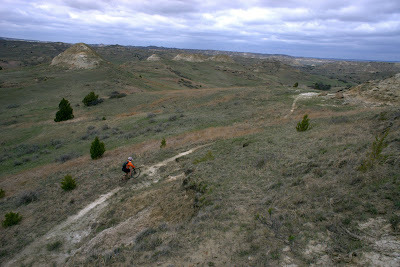 I took fast strides along the rim and dropped off the plateau into the wide valley of Little Missouri River, hoping to connect the missing link of the trail (my run the day before had taken me within two miles of the river.) The valley bottom had been saturated by recently receded flood waters, and the surface varied from wet mud to grass swamps to nearly un-walkable bogs. It certainly wasn't fast or easy running, but I enjoyed the adventure. At mile four, I came to a fast-flowing, potentially neck-deep waterway called Whitetail Creek. I waded in and quickly sank to my knees, then decided to turn around. The river was still nowhere in sight. I expressed silent gratitude for Dakota Cyclery and their efforts to whisk us around this partially collapsed, mud-bogged, half-drowned and undoubtedly dangerous section of the Maah Daah Hey. I felt good for the 12 miles back up the plateau and into camp, so I refilled on water and announced I was setting out to make it an even 20. A half mile down the trail, I came to another waist-deep stream I just didn't feel like crossing, so I veered up to an oil rig access road and put in three miles of slogging hill repeats at the end of a four-hour run. Silly, I agree, but it just felt good to complete a full 20-mile run. Day four was a long day, 26 miles, and to top it off, we woke up (again, frustratingly early) to 30 mph winds gusting to as much as 55 mph. I'd already warned the group about the deep stream crossing first thing in the morning, and combined with the unknown terrain ahead and fact they had to travel 26 miles no matter what, everyone was anxious to get out of there. I was barely out of bed by the time half of the group was grinding up the trail, and with Dave and Ryan, I was the last to pack up and go just after 8 a.m. The wind was thankfully favorable, blowing from the south, but that didn't stop the battering from crosswind and headwind gusts on the winding trail. I cranked hard to catch up with the group and didn't even pass the runners until mile 6.5. Despite two days of wind and sun, the trail was still gooey and bikes were beginning to protest loudly. My Rocky Mountain Altitude (generously loaned to me by Keith) had a bar on the seat stay that collected mud and stopped the rear wheel from turning on a regular basis. Despite multiple lubes, my chain seemed to dry out in seconds and the entire drivetrain squeaked and groaned with increasingly volume. Since it wasn't my bike and nearly new to boot, I tried as hard as I could to keep it out of water and really wet mud, but still the hubs and bearings were beginning to make strange noises. Dave is a talented mechanic and even he couldn't anticipate a realistic solution short of pulling everything apart, deep cleaning and replacing several pieces. "Let's just limp these bikes to the end," he said. We were only seven miles from the finish when we came to a trail junction, the Maah Daah Hey Trail or the newer Cottonwood Trail. Dakota Cyclery had highly recommended Cottonwood and Dave and Brenda remembered it as being fun, so we set out that way thinking we might be able to wrap up the ride in an hour. 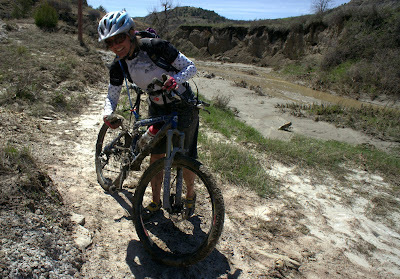 Our bikes were mud-battered, we were wind-battered, and I think everyone just wanted to be done. I expected a focused hammerfest. But the Cottonwood Trail dished out something else entirely. That is, what was left of the Cottonwood Trail. What hadn't been completely stomped out by cows or washed away at the valley bottoms had tumbled off the hillsides. Entire sections with multiple switchbacks had crumbled. Tree-protected section of singletrack were bogged in shin-deep mud. 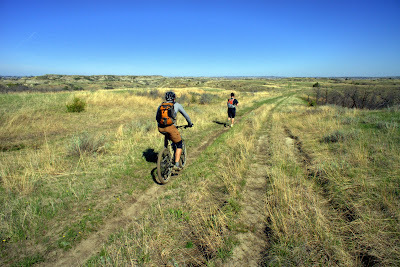 The Cottonwood Trail was slow riding at its best, hike-a-bike if we were lucky, and bike-carrying frequently. The runners passed us, smirking just a little as they hopscotched the cow postholes while we trudged with our bikes along the grassy sideslope. 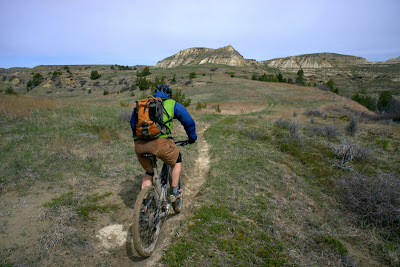 "This is why they call it adventure biking," Dave said, and I grinned. Yet another section of completely washed-out trail. The singletrack once went straight toward that post. Now it simple drops clean off a 25-foot-deep unstable trench. We had to bushwhack the long way around the gorge. In spite of my efforts to soft-pedal when I could pedal, my chain continued to become caught in unworkable ways. Even when I set my gears in a workable singlespeed and vowed to no longer shift, I'd whisk some brush or bounce hard along the cow postholes and get chainsuck again. Eventually, I sustained such an epic chainsuck that Dave had to pull the crank to alleviate the jam. My bike was officially beginning to fail. Still, those final miles of trail were absolutely gorgeous, my favorite of the entire trip, and I was OK with the prospect of taking it even slower. Luckily, I did keep my chain spinning even though I still had to drag my bike down more landslides and around more washouts. My favorite part of the day's ride happened two miles from the finish, when Ryan and I climbed up onto a narrow rim and shot down the other side with the 35-mph wind directly at our backs. Suddenly the loud roaring world turned completely silent as we rocketed down the grassy slope in perfect harmony with the wind, hair whipping and tears streaming as the canyon bottom spread out below us. As it turned out, we weren't even on the right trail. We had taken a wrong turn, and by the time we realized it, we had to turn and ride more than a mile back into that same hard wind. It was unbelievably slow and difficult, but worth it. In the end, it took nearly three hours to cover that seven-mile Cottonwood Trail. An adventure indeed. We had to wait for the shuttle for more than two hours. There was nowhere else to hide from the increasingly chilly and powerful wind, so we ended up huddling against the campground outhouse (i.e. "North Dakota Hilton") napping and watching for snakes in the grass. That night, I would end up taking the midnight shift on the rainy drive into Lewistown, Montana, where we took badly needed showers, scraped away four days worth of hardened mud and salt from our bodies, and then crashed out for four hours before continuing onto Calgary the next day to catch my flight to San Jose. A lot of travel, but again, worth it. 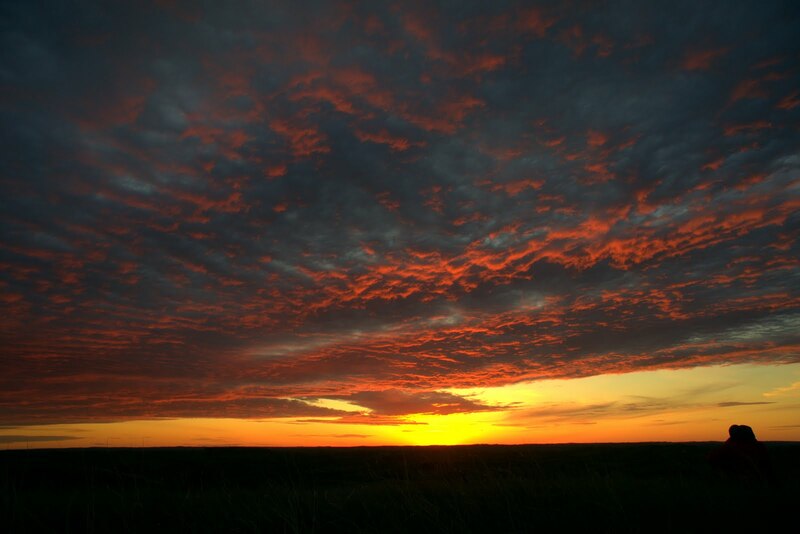 There's the easy and practical sides of life, and then there's exploring a remote corner of North Dakota for four days with good friends. It's like living outside — difficult to transition to and from, but worth it. 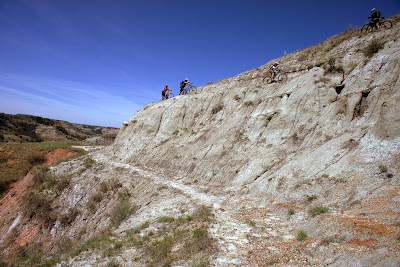 It was my first non-race, non-training-related, honest-to-goodness mountain bike tour in nine years. My friends who didn't know me back then hardly believe me when I tell them about the time I rode the 100-mile White Rim Trail in Utah over three days and nights, truly struggling to finish each day's 33-mile ride and eating massive Dutch oven dinners at night. 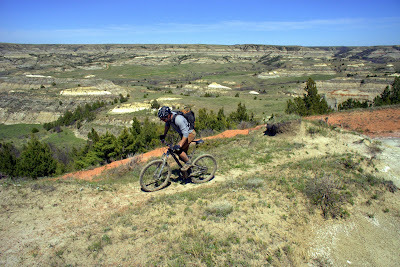 Some were equally confused about my reasons for embarking on a trip to North Dakota to ride the Maah Daah Hey trail over four days. North Dakota is one of those prairie states (i.e. boring and flat), and aren't four days an awful long time to travel a mere 96-or-something miles on a bike? Well, maybe, yes, but that was really the point — a nice, relaxed camping trip with friends. Not everything I do needs to be filed away as "epic" or "training for epic." That's not who I've become in the nine years since I dropped into the White Rim with zero experience or training. I can still kick back with the best of them. And it was a fun group to kick back with — my good friends from Banff, and their friends from Calgary and Canmore and British Columbia. There were eight mountain bikers and two runners. Sharon and Percy were out for their first vacation without children in seven years. Michelle had completed an Ironman but claimed to have not been on a mountain bike since 1993. Ryan was a professional photographer who hammered the steep climbs so he could set up his equipment for shots from the top. Dave and Brenda were the trip organizers, and the only ones who had ridden the trail before. I was the only American, the one who found myself explaining the conundrums of health insurance and fumbling through kilometer and Celsius conversions in my own country. Dave and Brenda set up a shuttle service with Dakota Cyclery, who ferried all of our supplies gear to each day's destination so we could carry almost nothing and eat fresh produce and meat for dinner. Brenda and Dave planned this trip six months ago, having no idea that the winter that followed would bring beyond-record snowfall, floods and heavy rains. The Little Missouri grasslands were inundated and the bentonite soil had been reduced to a sticky, generally unrideable version of wet cement. 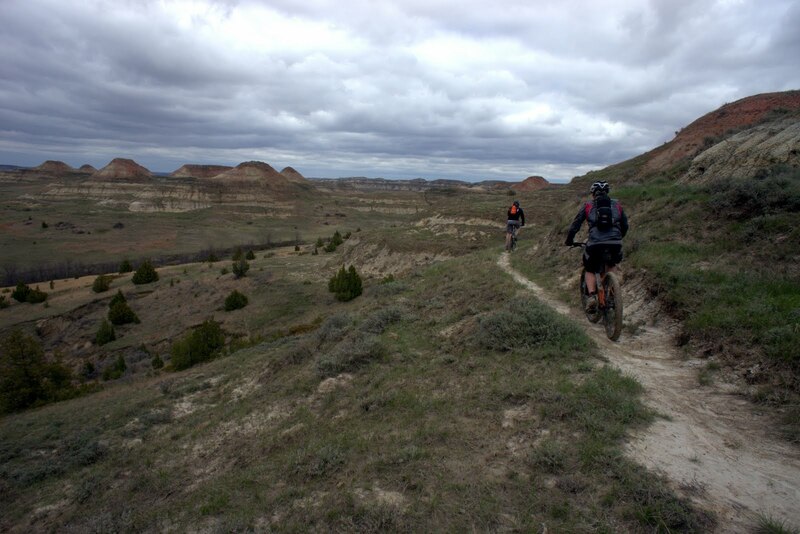 The owners of Dakota Cyclery didn't outright discourage us from embarking on the trip, but they did make it abundantly clear that if we chose to set out, we might not make it very far. Since trail damage was not a concern (bikes have nothing on the elevated rate of erosion in the badlands), we decided we had traveled too far to not at least try. 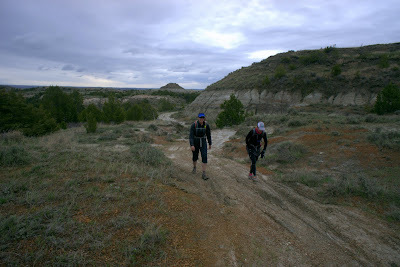 We had to completely rearrange our trip plan, starting from town rather than the north end of the trail, and set up an extra shuttle to ferry everyone around the reportedly uncrossable (10 feet deep and rising) Little Missouri River. Heavy clouds hung over the moist grasslands and patches of snow from a recent blizzard clung to the hillsides. All of my more epic mountain biking experiences have led me to fear sticky mud over all other conditions, and I was admittedly a little bit nervous. Maybe we were embarking on an epic after all. The narrow trail was soft and sticky, but not enough to stop wheels from turning. 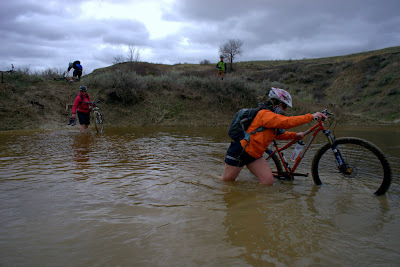 Still, there were a surprising number of knee-deep streams to cross, and a lot of extra weight to haul as the mud clung to wheels and frames. But what was even more surprising to me was the variability of the terrain. 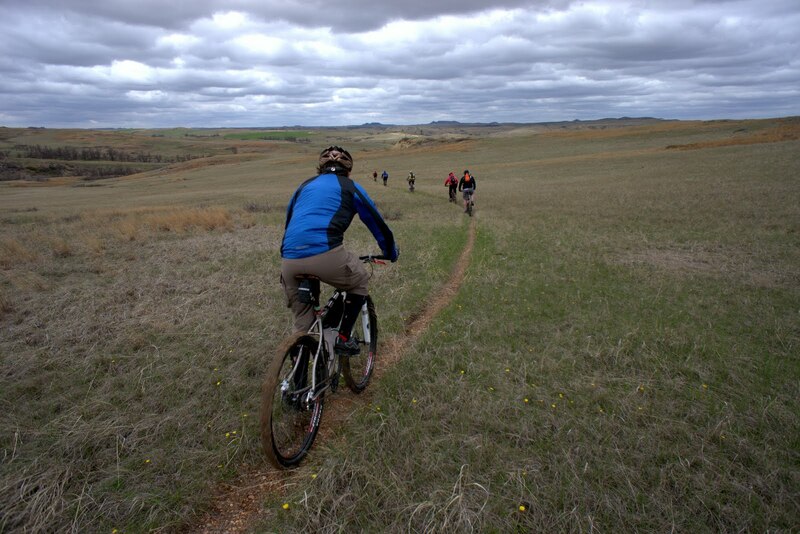 I expected rolling grasslands, similar to the kind I had once pedaled through in the Sand Hills of Nebraska. 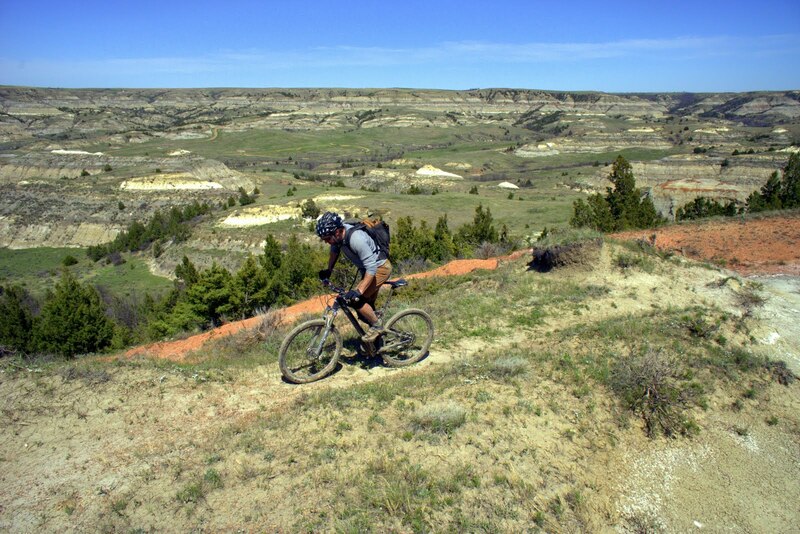 I knew there'd be badlands as well, but I didn't anticipate the deep gorges, multicolored rock and otherworldly formations that peppered this little-known corner of the northern Midwest. Of course, there was plenty of prairie, too, which is what makes the Maah Daah Hey so unique. The trail drops into rugged canyons as colorful and uniquely formed as a Utah desert drainage, then rises into hills carpeted in grass and flowers beneath an expansive Midwestern sky. 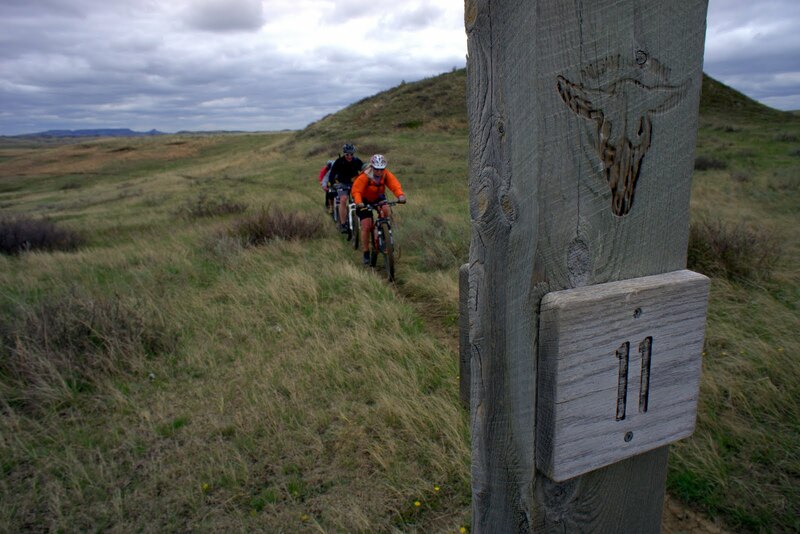 Not to mention it's nearly 100 miles of continuous singletrack, a rare thing indeed. It's not often that bike-friendly singletrack can actually be used to go anywhere. That's one reason I'm surprised there haven't been more efforts to "race" the Maah Daah Hey. It was a chilly day, with moderate winds and temperatures in the high 40s. I felt cold all day despite several winter layers, probably because I am used to continuous efforts rather than the stop-and-go of casual group riding. The stops were enjoyable, though, and the scenery was continuously surprising and gorgeous. And the best part — we had it all to ourselves. 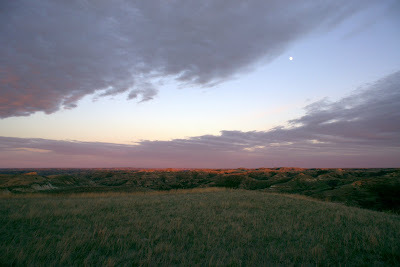 Western North Dakota is wide-open and sometimes vastly empty, a beautiful kind of space to explore in the modern world. The Dakota Cyclery owners assured us we were the first group on the Maah Daah Hey trail this season, and were likely the first people to through-travel the trail since the harsh winter ravaged the region. This fact made us feel a little bit like explorers — like the Lewis and Clark nostalgia that saturates this region — setting out to discover a trail that might just take us all the way through to the other side. Leslie and Angela were in good spirits, having set out with the intention of running a trail marathon a day for four days straight and moving at about the same average speed as the mountain bikers. They were able to start at the actual beginning of the Maah Daah Hey Trail through the Theodore Roosevelt National Park. 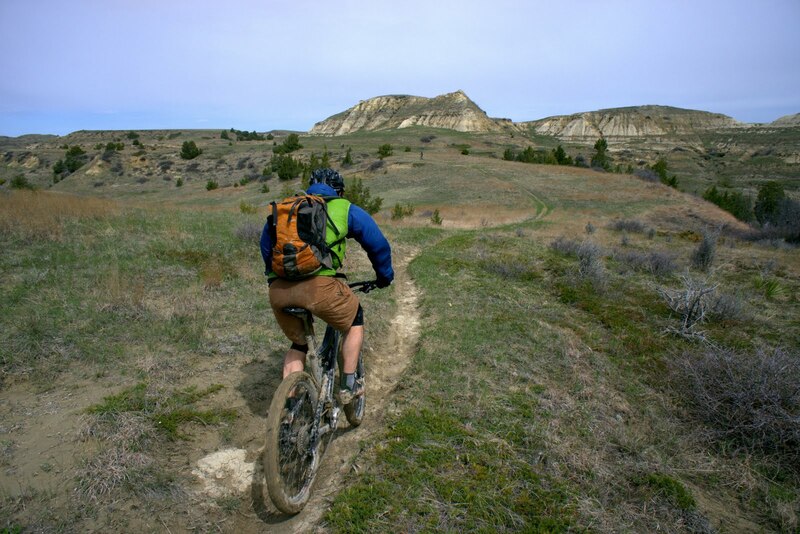 Since bikes aren't allowed in national parks, a different trail diverts cyclists 14 miles around it before the two rejoin. Day two began infuriatingly early. I discovered that not only was I the only American in the group, I was also the only night owl. Morning people just don't seem to believe me when I say that I don't feel tired at night, no matter how early I woke up in the morning, and it's often an impossible struggle to fall asleep before midnight. The sun set around 8:30 p.m. and everyone was generally in bed by nine. I passed time by wandering around camp trying to find pockets of cell-phone reception, reading the one copy of the Bismark Tribune I brought with me, and listening to rationed minutes on my iPod. I begged my friends to let me miss breakfast, but they still roused me by 7 a.m., half-packed and ready to go before the sun even hit the tents. So I usually felt sluggish and crappy until the ride was nearly over, but at least the sun came out on the second day. We also started to see the first signs of spring — patches of green grass, song birds, and flowers. Most of the hillsides were still gray and brown, but new color was emerging at an astonishing rate. The early starts also gave me plenty of time for my afternoon run, although I did also have to race the early dinner times (my friends are certainly going to razz me for whining when they read this, but it is truly difficult to adjust your usual sleeping and eating routines just because you're on vacation.) On day two I set out to explore a section of trail we would have to miss because of our requisite river shuttle. About three and a half miles from camp, I came across a massive landslide that stripped the hillside in two chunks and devoured at least a quarter mile of trail. Suddenly struck by a sense of adventure, I decided to pick my way across it and see how long it took to get to the other side. The slide happened recently enough that the mud was still very soft and wet. If I planted my foot in the wrong spot, I would instantly sink to my knees or worse. I nearly lost a shoe several times and once had a frighteningly difficult time extracting my buried leg from the sludge. Still, I was determined to find a way across the quagmire. I veered down to the toppled trees and picked by way through the brush, being very careful to stay out of the leg-sucking mud. After about 20 minutes of struggle, I managed to reach the other side and travel two more miles before turning around to take a similar route back. I returned to camp to tell my friends what my scouting trip revealed, and let them know we were very, very fortunate that we didn't have to ferry bikes through this spot. I just barely made dinner on day two, and was starting to feel a bit guilty for sleeping through breakfast prep and then running through dinner prep, essentially doing nothing for the group. I took up dish duty in a feeble effort to make up for my absences, but it reminded me how accustomed I've become to individual efforts over group vacations. I generally would rather throw together a few hastily prepared sandwiches and give myself more time to ride, run and sit by the fire than go to the effort of preparing big meals. But I was certainly grateful to partake in the spoils of the delicious meals, and grateful to my friends for putting up with my shenanigans. At sunset, Percy and I climbed up to the top of the plateau to catch a full view of sunset. We were richly rewarded for the third and final physical effort of the day. I sat in the grass for more than a half hour, peacefully content and filled with a satisfying sense of bliss. Whether I'm struggling to finish a 100-mile snow run or relaxing in the midst of a mellow bike tour, these are ultimately the rewards I'm seeking. I was in love with the quietness of North Dakota, happy to simply be there, at that simple but perfect moment.